Nothing else spells out ‘party’ better than the metallic. What was a show-stopping signature style statement during the 80s, the metallic trend, is again ushering a comeback in 2018, with a newfound definition and character. So, when it comes to the wedding’s festive vibe, the silver, gold, and copper tones can create a beautiful yet glamorous trend in dress as well decor, absolutely sticking to the mood of celebration of two souls in love. So, if you want to make your wedding to be one of a kind and garb your bridesmaids in grandeur and regality, then you should outfit your crew of ladies in ravishing metallic dresses. Some people are a little skeptical about embracing this trend because not everyone can pull it off with much panache and confidence. But that may be because you have not styled your girls wisely. Not all kinds of metallic dresses suit everybody. You have to find the shade and cut according to the complexion and body type of the beauties so that they shine like gorgeous divas on the d-day. There are plenty of manufacturers who can provide you with some amazing sequined and beaded gowns that will let your girls shimmer the night away. So, here we have some ways in which metallic dresses can make a comeback this wedding season. First of all, all your bridesmaids are not just girls helping you out in your wedding. They are your most beloved gang of girls who have promised to stand by you through thick and thin. So, you have to take care that they look nothing short of little goddesses on your special day. Indeed, it is your big day but don’t forget the role they have played in helping you arrive at this date. And styling a bridesmaid and deciding on their look has a lot to do with their complexions as well. Silver hues look amazing on paler skin tones while the ones who are slightly on the darker side or have an olive skin tone, look better in pewter, copper, or gold numbers. Make sure you keep these in mind while deciding on the perfect metallic outfit for your bridesmaids. Now if you have a big gang of girls with varied complexions, then you can opt for a mismatched look. While some of the girls can wear shimmery gold and the others can don a copper or champagne shade. Your wedding picture will look fabulous with such a combination and all your pretty princesses will also be happy. Sometimes, your vision may not be the same as your girlfriends. You may be basking in glory, thinking about how grand the ceremony will be when you walk down the aisle in breathtaking white while your surroundings will shine in all the glitters and shimmers, but the rest of your girl gang might just visualize themselves as disco balls in a nightclub. And that ain’t a pretty sight! So, what you can do is strike a balance. Make your girlfriends see that all that glitters is indeed gold; you just have to complete the picture for them. While they will be seen sporting enigmatic hues of silver, ivory, gold, or rose-gold in shimmers, team it up with neutral shoes, minimal accessories, and fresh white blooms. The boldness of the glitters will be rightly balanced by the subtlety of the toned-down accessories and shoes. 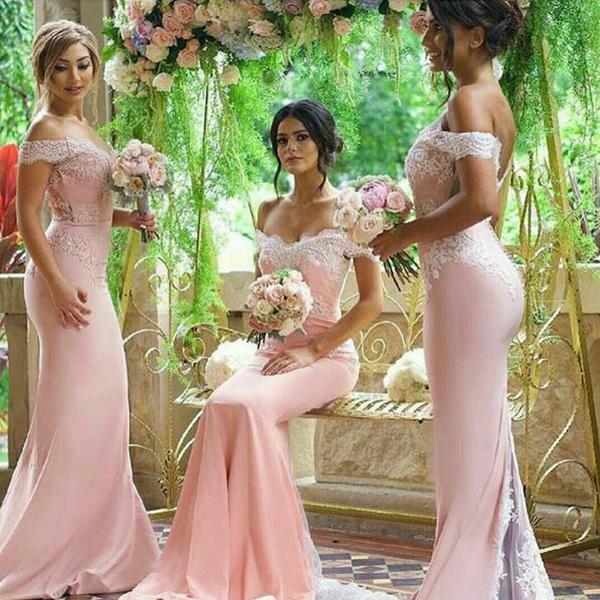 While you have been asked to keep the look balanced and chic, strictly focusing on the elegance of the look, don’t let your fashionista bridesmaids feel depressed! You can have a lot of scopes to take the metallic trend to a whole new level. Metallics stand for a dramatic festive look. So, you should not hold yourself from perking up the drama. Play up with your hairstyle and makeup. Add hair extensions, do glittery nails, sport a bold shimmery eyeshadow, and there you are! All your lovely beauties are going to steal the show. So, are you ready to dress-up your gorgeous beauties in some stunning metallics? Then, start with finding the right place which can provide you with gorgeous sequined and shimmery yet cheap bridesmaid dresses. Get started now.